UNALAKLEET — Girdwood musher Nicolas Petit dropped out of the Iditarod Trail Sled Dog Race on Monday evening after his dogs refused to continue down the trail. 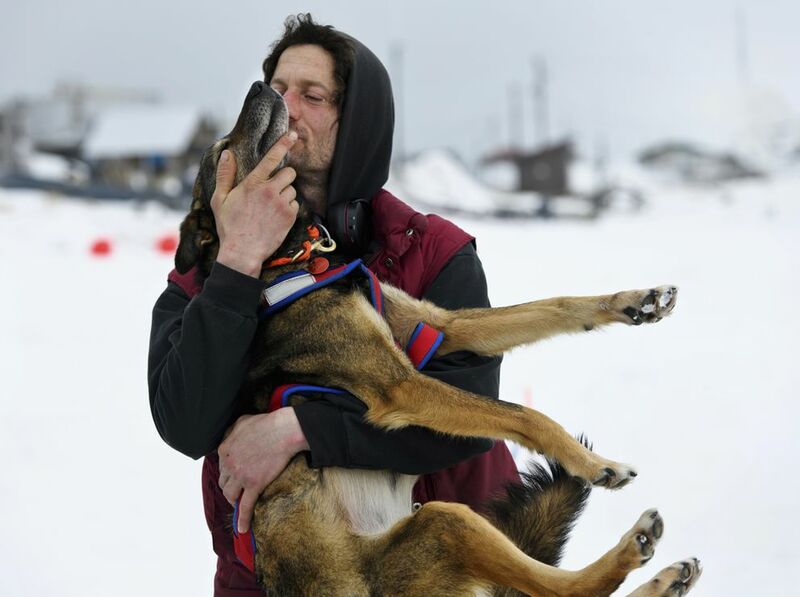 Petit and his 10-dog team had been leading this year’s Iditarod when they stopped roughly 14 miles out of Shaktoolik on Sunday night — more than three-quarters of the way into the 1,000-mile race. While camped on the sea ice, Petit told the Iditarod Insider that two of his dogs had gotten into a fight, and he yelled at one of them. Petit told the Insider that his dogs were eating and had no orthopedic issues. With Petit’s team stopped outside Shaktoolik, Bethel’s Pete Kaiser claimed the race lead Monday. Kaiser passed Petit on the trail and was first to Koyuk, about 171 miles from the finish line in Nome. Throughout the day Monday, team after team passed a stalled Petit. At one point, Petit had moved about 2 miles farther down the trail to a cabin, according to the GPS tracker. Around 5 p.m. Monday, the tracker showed Petit traveling back toward Shaktoolik, at race mile 777. He officially called it quits at 7 p.m. Monday, said a statement from race officials. Last year, Petit lost the trail and his race lead in bad weather out of Shaktoolik. Norwegian musher Joar Leifseth Ulsom passed Petit on the trail and went on to win the race. Petit got to Nome in second place. In 2014, Petit also encountered trouble late in the Iditarod. He was about 11 miles away from reaching Unalakleet when he and his team stalled. Petit eventually pressed his emergency locator button to officially withdraw from the race. Petit, originally from France, has an otherwise impressive record in the Iditarod. As a rookie in 2011, he took over veteran musher Jim Lanier’s team and finished in 28th place — even after he broke a bone in his foot on the way to Unalakleet. He won rookie of the year. He’s earned five top-10 finishes in the last eight years of competing in the Iditarod. Now, that dream will have to wait until at least 2020. ADN’s Beth Bragg contributed reporting from Anchorage.